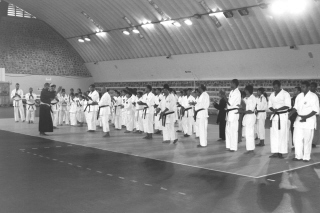 Bunbukan was formed as a vehicle for the continuation and preservation of the practice and principles of the art of Karate Do and its spiritual aspects. It is dedicated to the passing of the Budo culture and its arts. 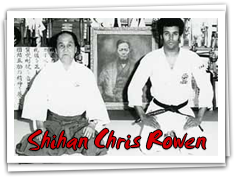 Its prime philosophy is to promote and disseminate knowledge, so it can be fostered and shared with anyone, who has an interest, in a non rigid non dogmatic way of learning Goju Ryu Karate Do. The meaning of Bunbukan lies within three Japanese characters. BUN can be interpreted as mind, study, education, literacy, arts and introspection. BU is the prefix to Budo that represents the way of martial arts, but the deeper meaning gleaned from the ideogram BU is to stop fighting and conflict and it is this aspect that we pursue within Bunbukan. KAN denotes the physical place where the mind and body can be joined in this particular practice. BUNBUKAN in simple words means: the place where we can study to stop fighting.